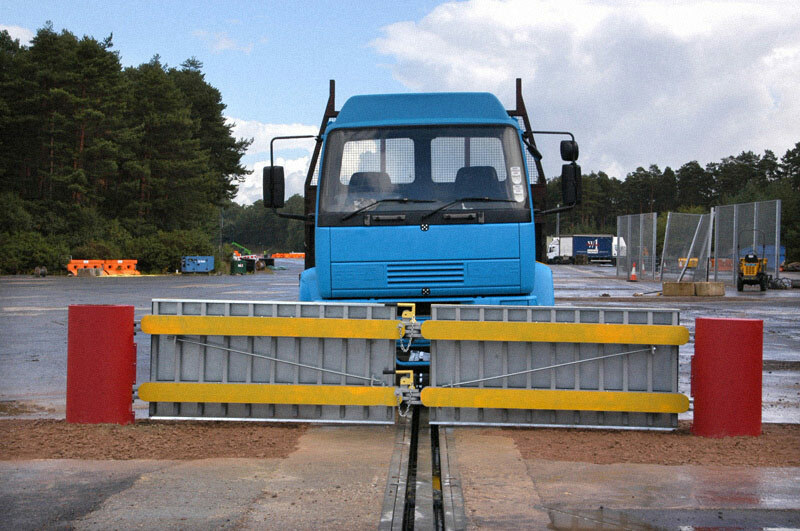 Defence-Structures DEAD STOP BARRIERS are designed to resist the impact from moving vehicles, and to stop them in a short distance without the truck or the pay load entering your secure area. They can be built to resist a variety of threats depending on the likely speed of approaching vehicles. They are designed to stop the truck dead in 2m, and to prevent penetration of the protected area. The 2m is the crushing of the truck, not the barrier. They can have chains or handrails connecting them to stop motorcycles or shopping trolleys. They should be combined with gates, labyrinths, cover from view screens and other defence structures. Keeping potential bombs as far away as possible from the vital areas is an important factor in force protection. Such road barriers may be accompanied by softer barriers to make them less lethal. The barriers may be founded in holes filled with concrete, or can be surface mounted on concrete plinths; you will need to describe the emplacement to us before design. Similar barriers can be built to withstand bigger vehicles at any speed, but it will usually be better to limit approach speeds if possible. Depending on their positioning they can also be suitable car bomb protection structures. Embedded bollards are an effective barrier to VBIED's and other high speed vehicle attacks. Such bollards can be installed or retrofitted with Defence Structures doors or gates with the ability to stop and destroy high speed vehicles. There is also a need for temporary road barriers, and barriers that do not need to have foundations. 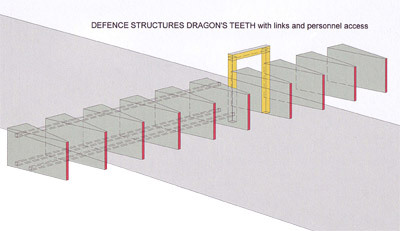 In this case the barriers are a battery of DEFENCE-STRUCTURES Dragon's Teeth. These are specially shaped triangular concrete blocks that can be lifted into position using a fork lift truck or crane and linked with chain to block roads or other possible approaches. The kit for these consists of sets of reusable formwork with sets of internal steel work, into which the client can pour concrete, either at a distance or on the final resting site. Surface mounted Dragon's Teeth are proved to be successful in stopping vehicle borne improvised explosive devices (VBIEDs) and all other types of vehicle attack. The surface mounted Dragon's Teeth can also be fitted with gates raging from personnel doors to large vehicle gates that will also defend against VBIEDs and all types of high speed vehicles. Gates are available from 4.5m to 12m, and the following sizes/combinations have been BSi PAS tested. For further information please use our contact form.